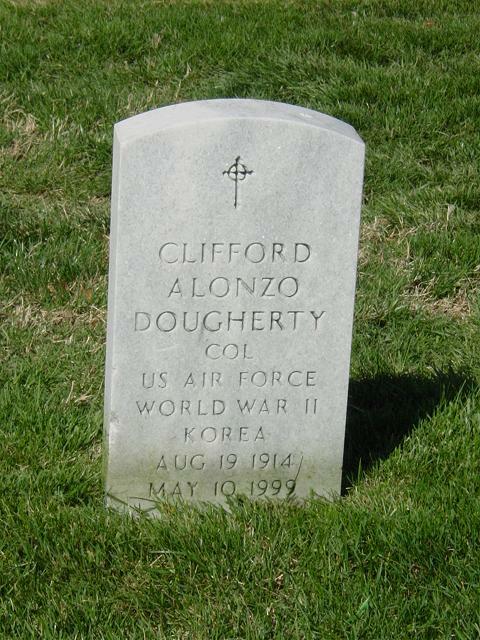 Clifford A. Dougherty, 85, a retired Air Force colonel who was was director of alumni relations at the George Washington University law school for 20 years, died of cancer May 10, 1999 at his home in Arlington, Virginia. He was a native of Montana and a graduate of Montana State University and George Washington University law school. He served in the military from 1941 to 1961. He served in the Army Air Forces in China during World War II and in the Air Force in Hawaii during the Korean War. He retired as provost marshal of the Military Air Transportation Service. He retired from his university job in 1985. His honors included a Bronze Star. He was a member of the Army-Navy Club; the Virginia, Arlington and American bar associations; the George Washington Club, the Fort Myer Officers Club and the Retired Officers Association and an elder of Little Falls Presbyterian Church in Arlington. Survivors include his wife of 62 years, Virginia F. Dougherty of Arlington; four children, Harriette Christensen of Copenhagen, Ralph Dougherty of Tallahassee, Jane Easton of Waldorf and Dianne Dougherty of McLean; two sisters; 10 grandchildren; and five great-grandchildren. At home, on Monday, May 10, 1999, husband of Virginia F. Dougherty; father of Harriette Christensen, Ralph Dougherty, Jane D. Easton and Dianne Dougherty. Also survived by two sisters, Mary Geerke and Midge Gutterude; 10 grandchildren and four great-grandchildren. Funeral services with full military honors will be held on Tuesday, June 1 at 1 p.m. at Fort Myer Post Chapel with interment in Arlington National Cemetery. In lieu of flowers, the family asks that contributions be made to The Clifford A. Dougherty Law Alumni Scholarship Fund, Dean's Office, George Washington University Law School, 2000 H St., NW, Washington, DC 20052.